The holiday season is all about making lists. Who's naughty and nice (better check that one twice), what gifts to buy for your friends and loved ones, bucket list destinations to visit, the items on your menu for the festive feast, and on and on. Santa's elves have compiled a new list for your consideration: The top 10 things you don't want to miss when you visit The Pinnacle Speedway in Lights. 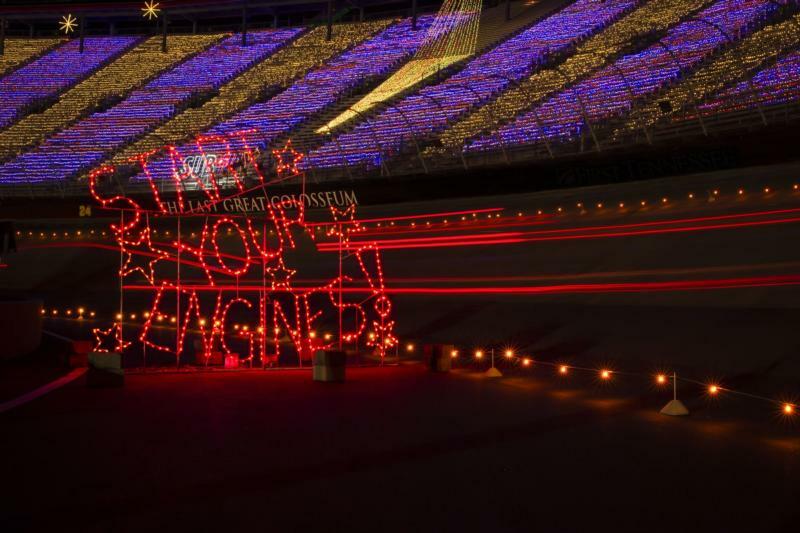 The brilliantly illuminated holiday tradition, The Pinnacle Speedway in Lights presented by TVA opens tonight at Bristol Motor Speedway for its 22nd year of bringing cheer to the Tri-Cities region. More than 200,000 guests from around the world will take in the spectacular light show that spans a five-mile route through the Bristol Motor Speedway property and showcases 2 million lights attached to more than 250 incredible displays. No. 10: You get to drive your car on the actual half-mile high banks of Bristol Motor Speedway! Your tires will touch the same all-concrete surface where so much NASCAR history has been made over the years. As a high-horsepower bonus, you'll get to also drive alongside the famed Bristol Dragway, one of the most iconic dragstrips in the United States. No. 9: Back by popular demand for its second season as an attraction along the route, the Race to Space presented by Mycroft Signs will take you on an interstellar journey. The galaxy themed tunnel which features a starburst light show will provide an out of this world experience for sure. No. 8: One of the Speedway in Lights all-time guest favorites, the Ripley's Aquarium of the Smokies Sea of Illumination, returns to the route to take visitors into a cool underwater world of holiday lights that is located underneath the frontstretch grandstands of the famed BMS oval. Other guest favorite displays that you don't want to miss this year include: The Dueling Dragsters, The Twelve Days of Christmas, Dinosaur Village and Ripley's Penguin Playhouse. No. 7: New for 2018, "Elf Vision" is sure to add a techo-digital feel as you wind your way through the Speedway in Lights route. Featuring a Christmas tree-shaped screen and a gift box screen, "Elf Vision" lights up if by magic through futuristic digital mapping projections. The display will change in real time to showcase colorful animations of Christmas trees, Christmas toys, the wrapping and unwrapping of presents and much more. No. 6: If your vehicle isn't big enough to fit your entire clan, consider these two fun group options: "The BMS Express" transforms a local school bus into BMS' version of the Polar Express. The ride comes complete with "snow" and a BMS tour guide who will have the whole group singing carols by the end of the ride. "The BMS Express" runs on Tuesday and Thursday evenings for only $10 per person. If you prefer to enjoy the route in a more natural environment, "Santa's Speedway Sleigh" sponsored by Tri-Cities Regional Airport provides guests with an open-air tram ride, complete with cozy blankets and a BMS staff member as the holiday tour guide. Passengers will enjoy hot chocolate and cookies prior to boarding. After traversing the entire route, The Sleigh will make a 30-minute stop in the Christmas Village presented by Eastman Credit Union. No. 5: If ice skating is your thing, The Pinnacle Speedway in Lights has you covered! The Ice Rink is the place you'll want to go with all your friends to get your fix. Located at the North Entrance, The Ice Rink presented by HVAC is available for only $6 per session ($2 skate rentals). No. 4: If you love holiday music combined with tons of lights - approximately 300,000 to be exact - you'll want to take in the popular Symphony in Lights presented by Grand Home Furnishings. Located in the Darrell Waltrip Grandstand, the lights in the display flash and flicker to the sounds and beats of holiday classics. No. 3: Take a fast pass to holiday bliss!! For only a few bucks more -- $45 (it's for the kids) - Jingle Bell Lane gives your vehicle permission to cut through the long line and have a much shorter wait before you are released to tour the fabulous light show. No. 2: Meet Santa in Christmas Village presented by Eastman Credit Union. The jolly old elf will be available in Santa's Hut for photos and to chat with your kids about what they would like him to leave under the tree this year. In addition the Christmas Village offers harmonious carolers, a petting zoo, carnival rides and special appearances by many other famous kid-favorite characters. On a few select nights you can take "Santa's Shortcut" for $5 per car and head straight to the Village. No. 1: Spending time with family and friends and savoring the great feeling you get by making a huge difference in the lives of so many children. That's what the holidays are all about! The Pinnacle Speedway in Lights runs through Saturday, Jan. 5. The event costs $15 for cars from Sunday through Thursday and $20 on Friday and Saturday nights. The Pinnacle Speedway in Lights is the major fundraiser for SCC-Bristol. 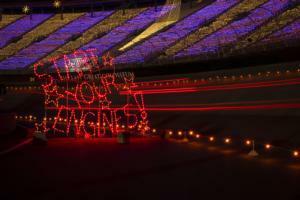 For more information, visit www.speedwayinlights.org. As always, all proceeds for The Pinnacle Speedway in Lights will be used by SCC to give to numerous organizations that serve children in the 18-county area surrounding BMS.